Listed as one of the top crime debuts of 2017 by Austin’s independent bookstore BookPeople. Shortlisted for the 2017 PEN Southwest Book Award. Finalist for the 2018 Texas Institute of Letters Sergio Troncosco Award For Best Work Of First Fiction. Oklahoma, 1994. The Waco siege is over; the OJ trial isn’t. Dean Goodnight, the first Choctaw Indian employed by the Oklahoma County public defender's office, pulls a new case—the brutal murder of a once-promising basketball star. The only witness is Caleb, the five-year-old son of the prime suspect. Investigating the murder, Dean draws four strangers into his client's orbit, each of whom becomes deeply involved in the case—and in Caleb's fate. There's Aura Jefferson, the victim's sister, a proud black nurse struggling with the death of her brother; Aura's patient Cecil Porter, a bigoted paraplegic whose own dreams of playing professional basketball were shattered fifty years ago; Cecil's shady brother, the entrepreneur and political manipulator "Big" Ben Porter; and Ben's wife Becca, who uncovers a link between the young Caleb and her own traumatic past. As the trial approaches, these five are forced to confront their deepest disappointments, hopes, and fears. And when tragedy strikes again, their lives are forever entwined. THE MIDNIGHT MAN is filled with joyful, vividly drawn details from the basketball games serving as backbeat to the story. With great compassion and grace, author David Eric Tomlinson explores the issues underpinning one of the most dramatic events in our recent history. Listed as one of the top crime debuts of 2017 by Austin's independent bookstore BookPeople. "Tomlinson has nice timing, and a good handle on voice. The Dallas author is an Okie, born and raised, and you can really hear his characters. And the characters are nicely fleshed out, too — real human beings with flaws that never lapse into cartoon two-dimensionality. It's a book about hope, which comes at a good time. After last year's polarizing election, it feels good to see through the eyes of his creations — people who are really interested in understanding one another's lives as opposed to just shouting over them." "The setting, 1994 Oklahoma, is vividly rendered ... native Sooner Tomlinson does a great job of giving his characters roots in an often overlooked locale - not quite the South, West, or Midwest." "With its swiftly moving plot and compelling cast of characters, THE MIDNIGHT MAN is a lively portrait of America bearing down on the end of the last century: divided by race, united by the sense that we’re all in this together, set to be transformed by unimaginable violence. David Eric Tomlinson has the novelist’s finely tuned ear for language, the journalist’s grasp of unfolding history, and the native son’s unerring sense of place. His is an important new voice." 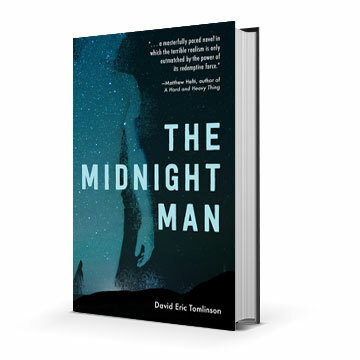 "THE MIDNIGHT MAN is a novel about family in the modern world and the difficulties of finding true understanding in even the closest relationships. Woven around and through a tragic death penalty case, the characters come alive on each page. We see vividly, richly the human demands on those caught up in America’s system of capital punishment. This novel gives a rich portrait of the forces driving wedges between people on different sides of the death penalty debate and, perhaps more importantly, the forces that unite them. This is a sad but wonderful book." "David Eric Tomlinson’s insightful debut novel overflows with grit and beauty. Tomlinson deftly portrays the interrelated machinations of both rural and urban America with the big-picture skill of a David Simon, while demonstrating the uncanny ear for language of a Richard Price. Through it all, he never loses sight of the individual’s enormous potential for grace. Whether tackling issues of race or politics, crime or punishment, victims or saviors, THE MIDNIGHT MAN refuses to shy away from any horror. The result is a masterfully paced novel in which the terrible realism is only outmatched by the power of its redemptive force." "This is a big book. Big not so much in the sense of "long," but big in the way that it maps the intersections of the personal and the political; or, better, the private and the public. It also deftly engages with any number of genres, from legal procedural to domestic drama, as it asks us (we readers) to reimagine our own engagement with those things in our lives that feel so inexorable. Perhaps most timely about the book is its setting: Oklahoma, "flyover country," the early to mid-1990s. Hopefully we all remember what those coordinates entail, and have not forgotten how that particular history continues to reverberate in the history being made around us now.... some of that being history we can still prevent, if we care enough to do so." "Tomlinson meshes local politics, college basketball, and the south in this wonderfully gritty crime novel you just can’t put down. THE MIDNIGHT MAN is a book to watch out for." "It was an honor to have been a part of that Oklahoma State squad's success, and to relive the experience in the pages of this novel." "Tomlinson ... weaves a fictional portrayal of five diverse Oklahomans in an ambitious novel about overcoming racial, social and political differences."